The ProFill Bottle line of fillers is designed to deliver world-class filling technology and performance in a small foot-print and at a great value. ProFill beer bottling equipment Bottle is an automatic, monobloc bottle filling system comprised of a rotary water rinser, counter-pressure-gravity filler, and turret mounted crowner. ProFill Bottle models range from 50bpm (12oz) up to speeds in excess of 300bpm (12oz.). All ProFill Beer Bottle fillers are flexible enough to run a full range of bottle shapes and sizes. 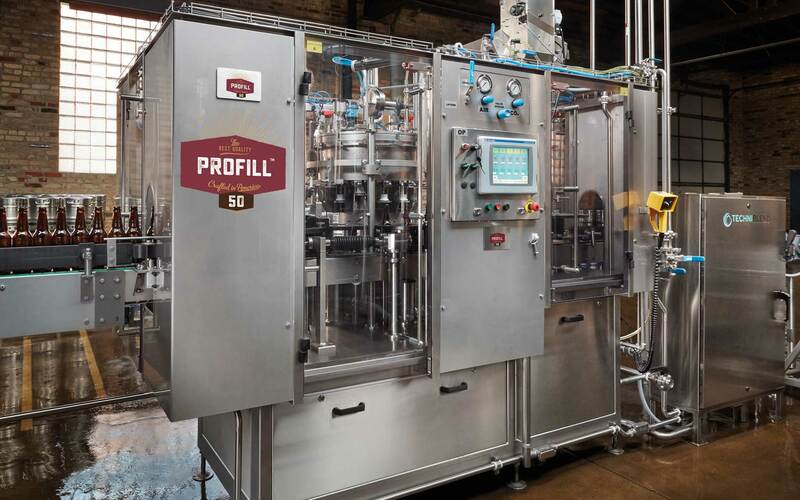 ProFill Bottle fillers are the next logical step-up from slow speed, manual, inline filling systems. ProFill Bottle fillers incorporate an integrated vacuum assisted air pre-evacuation system that pulls residual air and therefore oxygen from the bottle once it is sealed to the filling valve. This pre-evacuation technology immediately reduces air and oxygen content in the bottle. ProFill Bottle fillers are true Isobaric (counter-pressure-gravity) style fillers that also counter-pressures the bottle with CO2 prior to product filling. By counter-pressuring the container with CO2, the ProFill filling system drives out even more air and oxygen from the bottle. The ProFill Bottle filling system utilize industry leading MonoBloc designs and configuration which reduces unnecessary container handling, improves production speed and throughput, and maintains positive control of the bottle during the entire process. This approach, which is found in much larger and more expensive systems, is superior to inline or intermittent motion filling systems and achieves higher speeds, better efficiency, and lower TPO (Total Package Oxygen). ProFill fillers utilize the most reliable and respected industrial PLCs and components from Rockwell Automation (Allen-Bradley) for superior automation and production reliability. The Compact Logix PLC monitors all functions of the system ranging from filling bowl level and pressure settings, product temperature, container presence, container jam, crown or can-end presence, production speed, and many other critical parameters. The integrated PLC with color touchscreen HMI (human machine interface) displays all functions, conditions and alarm messages. The ProFill PLC can even be integrated into the entire brewery network to provide a single point of view of other brewery functions from systems such as: ProBrew, ProCellar, ProCarb or more. 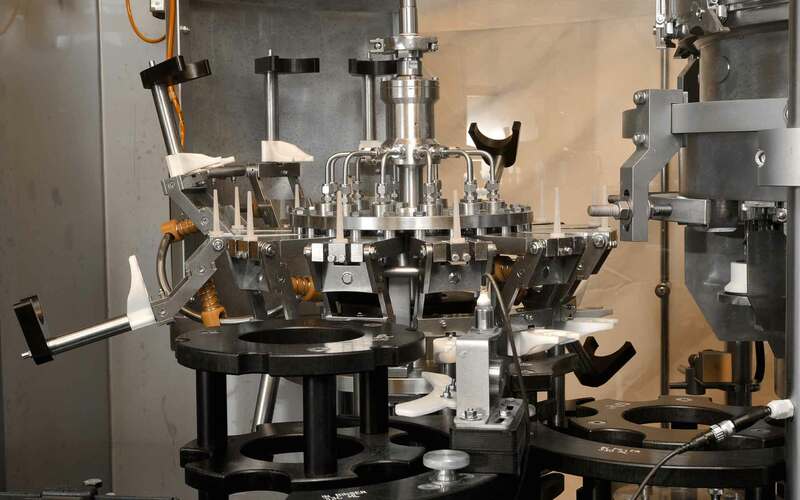 Unlike single speed, or intermittent motion low end filling systems, the ProFill line utilizes true variable speed production technology to automate your packaging line and help you realize higher production efficiency and speed. ProFill speed control can be easily adjusted from the operator touch screen or can be integrated into the production line to deliver a fully automated solution. ProFill incorporates proven chain, belt and gear drives designed for thousands of hours of trouble free and maintenance free operation. The Polymer gear drive system maintains tight synchronization of all starwheels, worms and container handling components, while also running quietly, lube-free and true for many years. Centralized and easy to reach grease points ensure that bearings and grease-points all get the right amount of lubrication, while the PLC system monitors runtime hours to alert operators of recommended maintenance cycles. Every ProFill system is constructed on a 304 Stainless Steel base for maximum corrosive resistance and durability. ProFill utilizes solid 304 Stainless Steel precision machined tables throughout generating a clean and a precise table for all rinsing, filling, crowning functions. 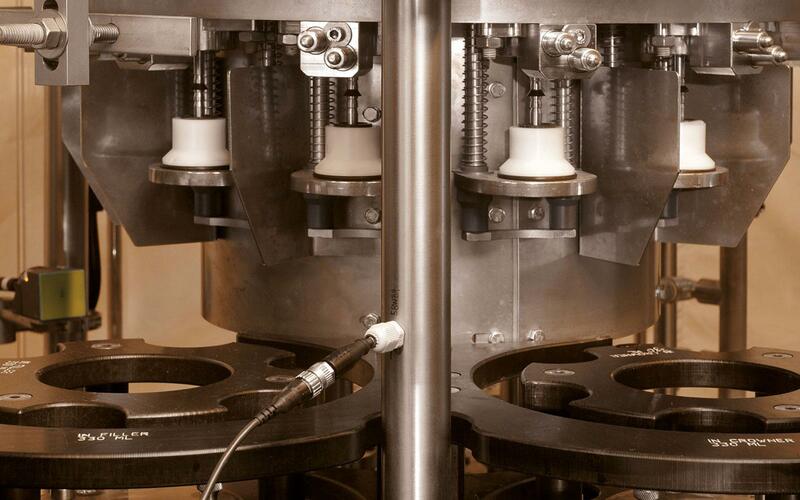 Container height changeover and adjustment is simple and can be accomplished in under 5-minutes with the ProFill Bottle rinser, filler and crowner height adjustment system. 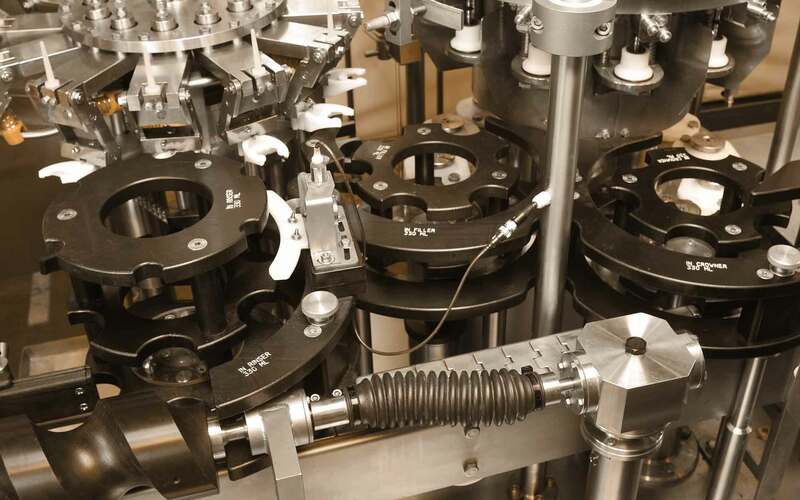 All filler control functions and operating cams (vacuum pre-evacuation, CO2 purge, counter-pressure, filling and snifting) can be locked and moved in sync with the entire system assuring repeatable setup parameters.  No, you don’t have to buy a new filler to run a different bottle size, unlike some low-end inline fillers. ProFill includes quick change bottle handling parts that allow a complete range of container sizes and shapes to run on the ProFill system with just a few quick adjustments. All control parts are labelled or color coded to simplify changeovers even more.